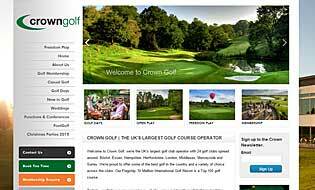 Imagination have worked with Crown Golf, the UK’s largest golf club operator, for over 10 years and have supplied the group with websites for the past 8 years. With the current websites coming up to three years old, the sites required an update and refresh. The main reason for the refresh, is to enable them to respond to current tablets and mobile devices. Crown Golf were not in a position to completely re-build their websites, therefore we proposed a refresh instead. Special Website Features – Advent Calendar etc. Crown Golf own 23 golf clubs spread around Berkshire, Bristol, Essex, Hampshire, Hertfordshire, London, Middlesex, Merseyside and Surrey.